We’re at the end. Today is chapter 11, The Power Of Peer Advantage. 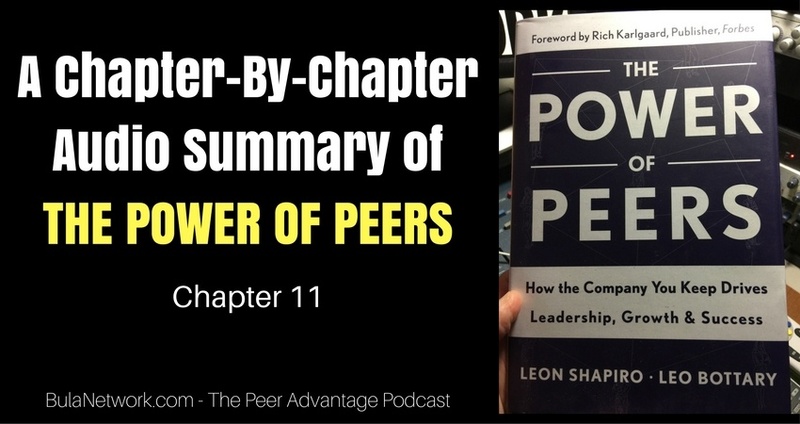 Over the last 10 episodes of the podcast we’ve been taking a look – chapter-by-chapter – at the book, THE POWER OF PEERS by Leon Shapiro and Leo Bottary. This final chapter ties it all together and discusses the power we can access when we join forces with others, namely with peers. The chapter opens with the story of Don Guild, a pharmacist in Southern California who opened a small drugstore with his dad in 1961. Don opened a new store every year until he had 13 locations. In 1969 he joined a CEO peer advisory group where all the members were working to grow their own businesses. Don had historically struggled because he was trained as a pharmacist, but he hated being a pharmacist. By 1982 CVS was descending on Southern California. That prompted Don to think it might be time to get out. A year later CVS contacted Don about buying his 13 stores. Then Thrifty Drug called him because they were looking to expand. Both companies wanted to open many stores in the region quickly. Don consulted his CEO group about how to go about selling his business. In 1984 he prepared an operating statement and a balance sheet so he could present them to the group for review. Based on the number, Don planned to sell his company for about $10 million. One member of the CEO group was running a public company. He and other members of the group reminded Don that his suitors had interest in his company for strategic reasons. His company had a good bottom line, but these companies weren’t looking at his business because of that. It was market position they wanted. The group told Don he should double his asking price. Don describes the face-to-face meeting with the CEO and COO of Thrifty Drug. They asked him what he wanted for the business. He gave the number his group had encouraged. The CEO reached across the table to shake his hand and tell him they had a deal. In a flash, Don realized his group had helped him get millions more than he’d have gotten without their feedback. Don deeply trusted his group. That’s why he sought and accepted their advice. He had put his financial welfare into their hands and won. Don experienced the power of peer advantage. That’s what accountability looked like for Don. Specifically, it looked like $10 million. Accountability isn’t a negative. Don is still a member of his group 47 years later. He’s well into his 80’s, but he primarily lives in Hawaii where he surfs and enjoys life. Each month he flies to Southern California to attend his group meeting and has no plans to quit anytime soon. What Accounts For The Magic Of Peer Advantage? Peer advantage isn’t an individual activity. It’s a group thing. It’s possible when you bring great people together who want to pursue excellence. The book has talked about such groups as the Blue Angels, the Navy Seals and the UCONN women’s basketball team. They understand what it means to optimize performance. They chase perfection knowing there’s really no such thing. Why go it alone if you don’t have to? Each of the 5 factors of peer advantage stands on its own. Each is important. There’s no magic in a single factor, or even in a combination of a few of them. They’re an ensemble, working together to create the magic. But the authors reveal there are 2 other ingredients to the magic they discovered while writing the book: the power of the triad, and the people. Back in chapter 6 they wrote of the power of the triad when they described how the group leader isn’t at the center of the hub, but how the group itself is the power, where the individual member, the leader and the group form this triad. Experience and spontaneity create extraordinary moments of kindness, wisdom, creative genius and understanding plus a whole lot more. Culture and other things can foster success, but at the end of the day, it’s the individual people and how they perform that makes the difference. Through all their research the authors discovered that the 5 factors and the strength of the triad created the conditions for success…yet success came down to someone in the group making a play. Somebody asked the right question. Somebody offered a new perspective. Somebody listened with empathy. That’s what happens when you put great players in the right environment. Magic happens and makes peer advantage possible. The chapter goes on to describe what a physical group meeting looks like. Members file into a room around 8am, grab some coffee and begin to exchange pleasantries to catch up with each other. Individual conversations fade as the group settles into place. The leader kicks off the meeting by having everybody take a turn to report on how they feel personally and professionally. Each member is invited to update the group on any developments since their last meeting. This check-in keeps everybody informed, but also serves to help identify issues or opportunities they may want to explore for deeper discussion. Within the first 20 minutes it’s clear that this isn’t an ordinary get together. It’s a deeper engagement with higher involvement, candor and accountability. Some CEO groups invite speaker that the group finds interesting. Other groups meet for a specific period of time — a half day, a full day. After the check-in they may begin immediately to process issues facing specific members. Things start to gel. You can feel it. Taste it. The context is different than usual conversation. When you’re in the middle of the conversation about a member’s issue and the complexity of the issue is becoming increasingly clear, you realize the power of the moment as members attempt to untangle things. It’s quiet when it needs to. Noisy when appropriate. Everybody is in the moment. Members are present, listening and looking. An epiphany is coming and you sense things are about to shift. Maybe it doesn’t happen in a single instance, but rather in a compounding effect over the course of the conversation. After a period of time – 30 minutes, 45, 60 – the member with the issue has been given time to think. The leader asks, “What have you heard and what’s resonating with you?” And they’ll respond. The authors cite a book entitled THE THIRD OPINION. The author of that book talks about trust falling into 3 buckets. We trust people personally because we get to know who they are as a person. We trust friends and colleagues whom we get to know socially. We trust people for their subject-matter expertise. We trust a pilot we’ve never met to fly us safely to our destination. We trust people who have our backs, to not have a personal agenda and use something against us. This is structural trust. It’s easy to see how a CEO peer advisory group incorporates the triad to provide trust on all 3 levels. One purpose of the book, according to the authors, was to introduce the reader to an option for learning and growing personally and professionally. An option that you may not be accessing as a CEO or business owner. Maybe because you didn’t know about it. Maybe because you didn’t think you had enough time to participate. Or maybe because you’re not sure what group to join or how to start your own. Or it could be, you’ve learned about peer groups and concluded they’re not right for you. Whatever the case, welcome to the majority. Fewer than 1 percent of CEOs participate in a CEO peer advisory group, but the most high performing CEOs who are members of a group say their experience has lifted their organizations and changed their lives. The authors say they wanted to provide a closer look in hopes that the 99 percent might give it a try. For CEOs, tapping into peer influence can be great for two reasons: the number of people who have sat where you now sit are few and far between plus in spite of your organizational structure certain initiatives will fail. You can tap into peer influence or be a victim of it. Peer influence impacts all of us. That’s why it can be valuable to understand how people typically engage their peers and for what purpose. We connect with peers in person or online. We connect to review, gather and exchange information and to extend our reach personally and professionally. We’re not necessarily selective when we connect, but we tend to trust the prevailing sentiment of the community. We network online or in person (at conferences, local business or social events). We tend to be more selective and purposeful here. Connecting and networking are individual efforts and are the most common ways we reach out to peers. We optimize when we work together in teams to bring a high level of excellence toward achieving a common goal. CEOs and business owners accelerate their business and leadership when they’re members of a peer advisory group working together on an ongoing basis. Select the right peers – it involves more than surrounding yourself with the right people…you need to be surrounded by people well suited to share and understand your pursuits. Create a safe environment – deep conversations about critical intellectual and emotional issues require an environment where it’s safe to share, be vulnerable (judgment free) and where confidentiality is sacred. What happens in the meeting stays in the meeting. Utilize a smart guide – leaders who learn to serve the groups they lead by acting as an equal part of the group triad. Foster valuable interaction – a group culture that values safety and confidentiality. Where conversations happen by design, not by accident. Be accountable – a place where group members don’t tell each other what to do, but where they tell each other what they plan to do. A place where individual members own their own solutions. Peer advantage is power. The power to change, to manifest your vision, to win and to differentiate you from your competitors. Perhaps the biggest win, the greatest gift of peer advantage, is freedom. Freedom to live and love your life as you choose. I hope you enjoyed this short series – an audio summary, chapter-by-chapter – of THE POWER OF PEERS. In our next episode we’ll bring on Leo Bottary, co-author of this book to discuss more about him and the power of peer advantage.